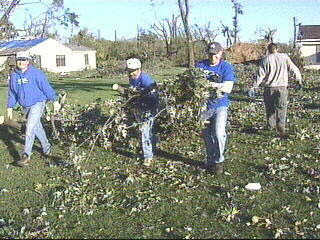 Saturday’s coverage of clean-up efforts in Nappanee, Ind. featured members of the Grace Community Church, a Grace Brethren church in Goshen, Ind. Pastor Jim Brown, who also served as this year’s moderator of the Fellowship of Grace Brethren Churches, is quoted. The southern Elkhart County community was hit by a massive tornado on Thursday evening (October 18). To view the entire story, as broadcast on WSBT (South Bend), click here. People in Nappanee are still trying to get over the shock of the devastating storm that leveled homes and business in Nappanee and northern Kosciusko County, and tore lives apart. But now, many have also turned their attention to the massive cleanup effort. “The noise was deafening. It was. It was like a freight train. It was loud, real loud,” said Kathy Magner. The storm left her yard in a big mess. But Saturday, she and others in Nappanee are getting some much needed help to clean it all up. Volunteers from Grace Community Church are just some of the many people already helping the people of Nappanee recover. On Sunday, instead of having church services in Goshen all three services are going to be in Nappanee, helping the people. “Instead of going and learning how to be the church, why don’t we be the church and go out and do it,” Brown said.